Standing on a hill high above the Tagus River the UNESCO World Heritage city of Toledo was the former capital of Spain until 1560 when Philip II moved the capital to Madrid. The city is a ‘must-see’ for anyone visiting central Spain. The main attractions are the Cathedral, Alcazár and Jewish quarter where two of Spain’s few remaining synagogues are found. Artistically, Toledo was the home of El Greco and you’ll find many of his works inside the city’s museums, galleries and churches. The most famous is his masterpiece ‘The Burial of Count Orgaz’ which is housed in the Iglesia de Santo Tomé. Nowhere else in Spain are you likely to come across so many places of interest within such a small area. A one day visit doesn’t do justice to the city as there is so much to see so, time permitting, you really should aim to spend a night here so that you can visit some of the many sights in the early morning before the hordes of tourists arrive. This also gives you the opportunity to dine on local specialities such as stewed partridge in one of Toledo’s traditional Castilian restaurants in the evening. If you’re heading south after Madrid and have your own transport or driver it’s a good idea to stay in Toledo then head towards Andalucía via the Don Quijote windmills of Consuegra. The city’s history can be traced way beyond the Romans but it was under the Roman Empire that Toletum was developed as a strategically important point standing in the geographical centre of Roman Hispania. The Visigoths moved their capital here in the 6th century and the Moors later established Toledo as the Muslim capital of central Spain. 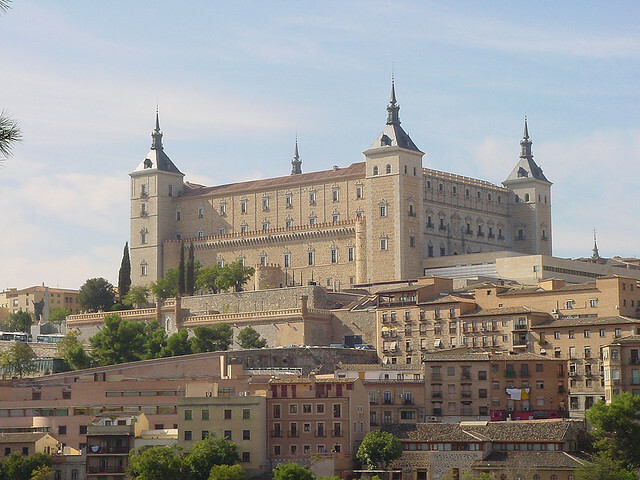 In 1085 the city fell to Alfonso VI and the Vatican recognised Toledo as the seat of the Catholic Church in Spain. For a period of time Toledo’s Christians, Jews and Muslims coexisted and the city became known as ‘the City of Three Cultures’ until 1492 when the fall of Granada to Fernando and Isabella (the Reyes Católicos or Catholic Monarchs) led to the expulsion of Jews and Muslims from Spain unless they converted to Christianity. Today you can wander around the city’s tiny streets discovering the many attractions of Toledo which mark the fascinating history of Spain’s ‘Imperial City’. Nowhere else in Spain will you see so many buildings of interest within such a small area. And nowhere else in Spain are you more likely to get lost whilst wandering around them! But don’t worry, it’s only a small city and you’re never far from where you want to be. By Bus: Buses depart every 30 minutes from Estación Sur de Autobuses (South Bus Station) on Méndez Álvaro (it’s got a metro stop). Services operate from 6am to 10pm and the journey takes between one and one and a half hours. On arrival in Toledo you’ll get off at the Estación de Autobuses next to the river. From here you can walk the 1.2km up a steep hill to the historical centre where you want to be or better still take bus 5 or 6 up the hill. By Train: There are ten services per day from Madrid’s Atocha Railway Station to Toledo. The fast AV Media Distancia Train take just 35 minutes. (Check latest timetables at www.renfe.es). Toledo’s quaint old train station is a 20 minute walk to the historic centre so get on the number 5 or 6 bus to Plaza de Zocódover if you don’t fancy the hike. Coach Trips: Many visitors to Madrid prefer to avoid the hassle of public transport and prefer to take one of the many scheduled coach trips which operate to Toledo. It’s also an option to hire your own driver and tour guide. The essential sights of the city include the stunning Cathedral, the Alcazár (Fortress), two Synagogues and the Iglesia de Santo Tomé where you can see El Greco’s greatest masterpiece. More of his works appear in buildings all over the city. If you are staying at or near the Toledo Parador you get a stunning panoramic view of the city’s main sights which isn’t possible from within the tiny streets of the historical centre. Below is a list of the main tourist attractions in Toledo. Toledo Cathedral: The site of the Cathedral dates back to Roman times. Under the Visigoths it was a basilica then under Moorish rule it became the city’s main Mosque. After Toledo fell to the Christians in 1085 Alfonso VI promised to preserve the building as a Mosque for the city’s large Muslim population. This promise was broken and construction of the great Gothic Cathedral of Toledo began in 1226. The building wasn’t completed until 1493 and as a result of these two and a half centuries of work there are clearly different architectural styles employed in the construction, notably Mudéjar (Moorish style whilst under Christian rule) and Spanish Renaissance. Amongst the priceless art collection inside the Cathedral the highlight is El Greco’s Twelve Apostles. Alcázar: As you approach Toledo from Madrid you’ll spot the Alcázar (fortress) from the distance as it strategically overlooks the eastern plains of Castile from above the Tagus river. The building dates back to the 10th Century when it was the most important city of central Moorish Spain. Under Christian rule it was supposed to be a royal residence but the court of Carlos I moved to Madrid so it served little purpose and became an army academy. The Alcazár became famous during the Spanish Civil War when it was almost destroyed during a 70-day siege. Franco had it rebuilt as a military museum. If you’re pushed for time we’d recommend that you take a look at the building from the outside as the interior really isn’t that interesting. Monasterio de San Juan de los Reyes: This monastery, with is exceptional cloisters, was originally a Franciscan convent built by Fernando and Isabella (Los Reyes Catolicos) between 1477 and 1504 to celebrate their victory at the Battle of Toro. They had planned on being buried here but later preferred Granada as their final resting place after they took the great Moorish city in 1492. Iglesia de Santo Tomé: This tiny 14th-century church consists of a single room in the Jewish quarter in which El Greco’s greatest masterpiece, The Burial of the Count of Orgaz (1586) hangs from the main wall. Toledo’s Synagogues: After 1492 the majority of Spain’s Jewish population was expelled by Fernando and Isabella. In Toledo there had been 11 active synagogues before the expulsion, today just two remain as museums. The Sinagoga del Tránsito, dating back to 1355, is the most interesting of the two most notably for the Hebrew inscriptions along its walls. The synagogue now houses a museum about the history of Jewish culture in Spain. The second synagogue is Sinagoga de Santa Maria La Blanca which was built in the 12th century notable for its horseshoe arches. Casa y Museo de El Greco: In the heart of Toledo’s old Jewish quarter (Calle Samuel Leví, 3 ) is the House of El Greco which displays an interesting assortment of works by El Greco notably ‘View and Map of Toledo’ (Vista y Plano de Toledo). Although the artist never actually lived here it’s still worth a look. This museum of art and sculpture stands just outside the Arab city walls and is worth a visit just to take a look at its amazing 16th century Gothic and Spanish Renaissance architecture. Inside you can visit the cloisters and displays such as Spanish ceramics as well as seeing more El Grecos, the most famous of which is The Assumption of the Virgin (Asunción de la Virgen), his last known work. Below we’ve listed a few Toledo hotels that we recommend in both the historical centre of the city and just outside. The list contains a good selection of properties but if you’re looking for somewhere special then we highly recommend that you stay at the stunning Parador de Toledo. This four star hotel has stunning views over the ancient city and is just a few minutes away by taxi from the historical heart of Toledo. The beautiful parador is located 5 minutes from the historical city by car on the Cerro del Emperador. The slight inconvenience of not being able to walk into the town is easily compensated for by the beauty of this former Toledo country house and the stunning views across to the centre of the city with its cathedral and Alcázar (fortress) easily recognisable. In addition the hotel has a great swimming pool and restaurant so after a day of seeing the sights of Toledo it’s nice to be able to head back “home” for the late afternoon and evening. The 5 star Cigarral El Bosque Hotel is located approximately 1 km from the centre of Toledo on the other side of the Tajo river. It is set in an old country house but the facilities are all new and modern. The rooms are large, elegant and very comfortable with fully equipped private bathrooms with separate bath and shower and all have wonderful views over the city. All of the rooms have either a balcony or direct access to the gardens. There is a swimming pool which provides a chance to relax and cool down after a day’s sightseeing and there is a bar and restaurant. The hotel has a Presidential Suite with butler service. This hotel is well located in the historic centre of Toledo in the old Jewish centre near all the tourist landmarks. Set in the restored old San Jose flourmill inside it is a modern and comfortable hotel. All of the bathrooms are equipped with a hydromassage bathtub and some also have a jacuzzi which are very welcome after a day spent walking round the city. The staff are very helpful and create a happy and friendly atmosphere. The restaurant provides a buffet breakfast and in the evening there are many restaurants in the surrounding area. Located on the opposite side of the river Tajo from the city centre this hotel is set in one of the most beautiful and peaceful areas of Toledo. All of the rooms are large and beautifully furnished with superb views of the city and come with a free minibar. The hotel restaurant offers a wide range of regional cuisine and stocks a selection of the best Spanish wines. There is also a fitness centre in the hotel for any guests wishing to do some exercise. The Hesperia Toledo is a small hotel located opposite the bullring about a 10 minute walk from the centre of Toledo. It is a modern hotel but still retains a typical Spanish atmosphere. The rooms are all beautifully decorated, clean and comfortable and the bed sheets are turned done everyday. It is only 5 minutes from the park which has a Tuesday market which is well worth a visit. There are a wide range of restaurants in the vicinity. The Hotel Pintor El Greco is ideally located in the Jewish Quarter of Toledo close to the city’s most important museums and churches. It is housed in a charming Toledan house that was formally a bakery. Its location is ideal, with easy parking, gardens, shops, and a wonderful view of “Los Cigarrales”, typical country houses on the banks of the river Tagus. The Abaceria Hotel is situated in “Los Cigarrales” one of the most privileged and prettiest areas of Toledo. It is surrounded by green areas with magnificent views of the historical quarter. The building respects the architecture of the area combining the residential charm of old Toledo with the traditional hospitality of the people of Toledo. The Casona de la Reyna is a small 3 star hotel located in the old Jewish quarter of Toledo making it a good choice for those who want to be within walking distance of the main monuments. All the rooms are well lit, clean and have wooden floors and comfortable beds. The staff are helpful and friendly and there is a small dining room which serves a buffet breakfast. For a comprehensive list of properties take a look at Booking.com’s Toledo Hotels. Toledo is not a city known for its gastronomy. You’ll come across plenty bars and restaurants offering good value ‘menus del dia’ but if you’re looking for something special serving up traditional Castilian dishes such as partridge or roast suckling pig then it’s a good idea to plan your dining rather than choosing a restaurant at random. Here are a few suggestions of Toledo restaurants where we’re sure you won’t be disappointed. This long established favourite is housed in an old Jewish townhouse which dates back to the 15th century. It is located in the heart of the historical centre, just a short distance from the Cathedral, and serves up excellent game dishes such as partridge and venison. Beef, veal and lamb dishes will delight the palettes of meat eaters whilst a favourite amongst fish eaters is the hake in saffron. This is the most famous restaurant in Toledo where you can try typical Castilian roast dishes such as suckling pig and young lamb or a partridge casserole. If you’ve already enjoyed dining in the famous Botin’s restaurant in Madrid then you’ll find the Hostal de Cardenal an equally enjoyable dining experience as it’s owned by the same family. Baked hake and smoked salmon are good choices if you’ve had your fill of meat. For exquisite local fare in the most charming of settings, the Casón de los López takes some beating. Popular dishes from the local countryside include partridge, venison and rabbit served in one of Toledo’s most charming buildings which lies on a small street near the Plaza de Zocódover. Another good choice for a traditional Castilian meal of roast meats or local favourites such as partridge casserole. If you don’t want a large meal you can go to La Abadia and just order tapas with a bottle of wine in the bar rather than going down into the restaurant. If you’re staying at the Parador of Toledo (guests also welcome) you might prefer to return to the hotel to dine. Its restaurant offers a stunning panoramic view over the city and the food isn’t bad either. Typical Castilian fare is available as well as fish dishes and a range of tapas.